There is a record-breaking number of GOP contenders for the 2016 election. Meanwhile, an incredible 512 candidates registered their names with the Federal Election Commission to run for president. Among those running are two separate men who claim to have invented Google, a young Brooklyn artist, a ninja and Sydney's Voluptuous Buttocks. And both Sara H. Paylin and Brystol S. Palyn have added themselves to the list. Here are some highlights of the men, women and animals who hope to be your next president. Gov. Bobby Jindal isn't the only 2016 contender out of Louisiana. Crawfish B. Crawfish, "a brilliant mind with a consistent record of being a crawfish," is a bayou native trying to give the governor a run for his money. 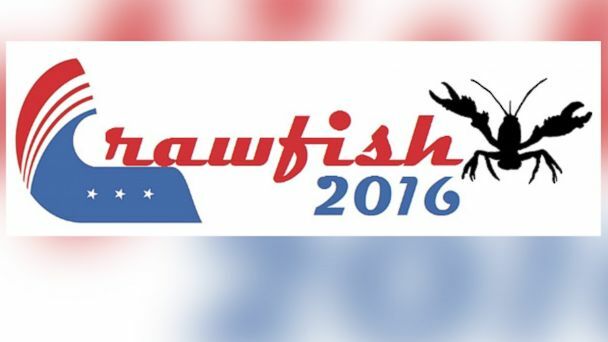 The "red-shelled" American's Facebook page -- "Can This Crawfish Get More Supporters Than Bobby Jindal? -- has hit over 26,000 likes. For Limberbutt McCubbins, a 5-year old cat from Louisville, "meow is the time" to jump in the race. Running on a platform of gay cat marriage, catnip legalization and support for the Affordable Cat Act, the feline has nailed down an endorsement from Jezebel and plenty of media attention in recent months. Turk "You Only Live Nine Times" Fratterson is another cat candidate out of Santa Monica, California. Jack Sparrow: An independent candidate who dresses like the famous pirate and wants to do away with the Electoral College if elected. Deez Nuts: Running as an independent from Wallingford, Iowa; population 197, so he shouldn't be too hard to find. Deez Nuts has gone viral and has quite the fan base. According to a press release by Public Policy Polling, on August 11, three percent of voters had a favorable opinion of the candidate. Angelo Yoshannah Scrigna: He was sued by the Walt Disney Co. (which owns ABC News) for trademark infringement after he allegedly tried to set up companies with names that included "Walt Disney." Christopher Earl Strunk: He was fined $177,000 by a New York State judge for what was deemed a "frivolous" lawsuit Strunk filed to have President Obama removed from the 2012 ballot. The "birther" filed the lawsuit based on the belief that Obama's birthplace made him ineligible to be president. Floyd Azrael Yancey: Goes by Azrael, the Grim Reaper, wears a Guy Fawkes mask and runs a "public-figure" Facebook page titled "Death." He has this sound advice in his announcement video: "What do we do about terrorism? Well, we stop panicking every time someone says they're going to bomb a plane." New Jersey native Jeff Boss, a 9/11 conspiracy theorist, has tried his luck at various offices, including two runs as an independent candidate for president in 2008 and 2012. His run for Senate hinged on his idea that the "NSA did 9/11." Self-proclaimed billionaire Josue Larose may be an unknown in the 2016 race, but Florida locals know him as the man who singlehandedly created over 300 PACs and doubled the number of political parties in the state per local reports. Willie Wilson: This wealthy Chicago businessman wants to represent Democrats who are opposed to the party. Although his run for mayor was unsuccessful, he leads a worldwide medical supply company and created "Singsation," a syndicated Gospel music show airing in all 50 states. Mark Everson: This GOP candidate recently filed an FEC complaint against Fox News over their candidate-selection process for the first GOP debate. A former IRS commissioner, he is perhaps best known for being asked to resign as president-CEO of the American Red Cross after an alleged inappropriate relationship with a female subordinate. Pogo Mochello Allen-Reese, known as San Antonio's "Magic Mike" mayoral candidate, is an exotic dancer and one of many who wish to secure the Republican nomination.